Key Advisors March 2019 from W Films on Vimeo. 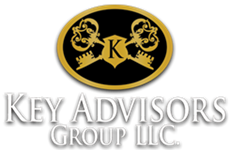 Key Advisors Group, believes they have a reputation as financial leaders who can see clearly when others views are clouded. This has made them a frequent guest on Fox Business. Key Advisors Group has dedicated themselves to helping others build a solid investment base from which to launch their retirement. Click on the link below to see additional videos. Key Advisors - Feb 2019 from W Films on Vimeo. Key Advisor Group - June 2018 from W Films on Vimeo. The information set forth herein has been obtained from sources deemed reliable; we do not guarantee its accuracy, completeness, or fairness. We have relied upon and assumed, without independent verification, the accuracy and completeness of all information available from public sources. You should discuss any legal, tax or financial matters with the appropriate professional. Neither the information presented nor any opinion expressed constitutes a solicitation for the purchase or sale of any security. The opinions and ideas of this piece are those of Key Advisors Group and do not necessarily represent the opinions of Williams Financial Group or its affiliates. The statements made regarding future prospects may not be realized. Eddie on FOX Jan 13, 2016.